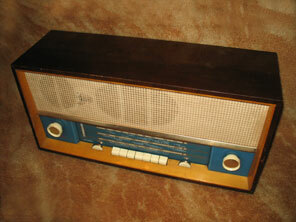 Shown here is the model A684, the table receiver at the top of the range when introduced in August 1960. It is housed in a substantial wooden cabinet 22 1/4" wide. 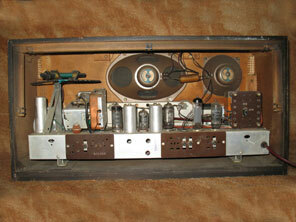 The receiver shares an identical chassis with the model A674 which had been introduced two months earlier in Jun 1960. The model A674 was housed in a plastic cabinet. Although the model A684 shown here used the same chassis as the A674, it included an extra 4" loudspeaker to improve reproduction of higher frequencies. This tweeter, together with the more substantial wooden cabinet resulted in better sound quality compared to the plastic housed counterpart. Separate treble and bass controls are included. Within the piano key bank of switches are "Speech" and "Music" pushbuttons to further enhance sound quality dependant on the programme being received. A wheel at the back of the receiver can be used to rotate the ferrite aerial optimum signal reception. The model A684 cost £25.7.2 + p.t whilst the model A674 cost £21.7.11 + p.t. As befitting a high quality table receiver, it incorporated excellent connectivity as can be seen in the photo of the rear of the radio above right. As well as the usual aerial, earth, gramophone pick-up sockets, also provided were tape recorder sockets. These provided an output suitable for recording on to a external tape recorder. These sockets were of the higher quality "phono" type, rather than the more usual wander sockets. Also available is a "Swiss L.W. socket", which enabled long wave signals received over telephone lines in Switzerland to be connected directly in to the receiver. It is interesting to note on the chassis that there are one or two extra cut-out's suitable for a valve bases right next to the output valve etc. These positions would have been used to accommodate extra sockets for valves when this same chassis pressing was used in a radiogram version (e.g. A674SR) which incorporated push/pull output etc. Valve line-up was 6L12, 6C12, 6F18, 6LD12, 6P15, EZ80, EM84.